This is Javelin's wyvern. Ive wanted to design a wyvern for the character for many years, but was never pleased with a design. Once i doodled this dragon in my sketchbook, i thought i had finally nailed it. Im nicknaming it Guavern, as its color pattern was inspired by the Guava Skipper butterfly, thank *super-ninja-monkeys for that name. This is another concept for my final project pitch. Oh yeah, thank ~NuclearBandaid for helping me on this one. That is...ok, I don't think I can come up with a word...unless I want to create my own word. Reminds me of the Rathalos from Monster hunter. Google-d wyvern and came across this BEAUTY! This is absolutely AWESOME! I love it! I love wyverns! Probably because it is a Nordic mythical creature. I just love the paddle and wings too. I would love to see the wings unfolded. 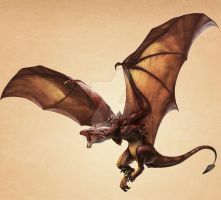 By the way have you thought if it can breathe fire or has venomous teeth etc, you know like wyverns are usually depicted. oAo did you somehow based it on the Archaeopteryx? This so great it hurts. there are no words for this..
Im sure you have gotten this before but it kind of reminds me of the Nargacuga in its body color, but at the same time it really is quite original, awesome job! Great Wyvern. Very realistic. More than few I saw in few movies. Good job. WOW ! What project pitch? Did you get it? I'm curious as to how to even started on a project like this.. is it for a game? Really awesome, but I can't help but notice the tail looks fat. Too fat for proper flight; I'd suggest making more of a 'fan-tail' if you ever make things like this; fan tails are great rudders. Look at it from above in the silhouette, it's very thin, just wide from the side. I've since updated it anyway. magnificent. i love wyverns more than almost any other dragon, save for the Great Dragons, whom are their only natural enemies. yours i especially like because of its armor and lack of a stinging tail barb. Very... spiky. That tail looks like it would unbalance it! OH. I see it now. i cant believe in my eyes! this is aaaawesome! this is phenomenal, how did you do the textures for the skin and scales? Has a really nice menacing and exotic look to it. Wonderful raptorlike posture. I love it! Badass. Only way to describe this piece. I'm speechless . . . . . The part of this I like the most is it's tail, which is a nub compared to most other dragon tails. The anatomy on this guy is perfect. The wings could use some more rippling to indicate length, unless, of course, the webbing is aesthetic or vestigial. Everything else is perfect though. Let me explain why I like the tail so much though. Difference is awesome, and compared to the usual, that tail is unique. It's not too often you see wyverns with clubbed tails. This goes in the interesting collection. Wonderful Job.